A hidden gem well-known amongst the local "ladies who lunch" set, Café Jacquemart-André provides a fabulous place to brunch away your Sunday afternoon when everything else in Paris c'est fermé. Housed in the former dining room of Edouard André and Nélie Jacquemart's art-filled 19th century mansion, the Café ranks as one of the most beautiful tea rooms in all of Paris. Tucked away off Boulevard Haussmann, just a stone’s throw from the Champs-Elysées, the peaceful gardens and mansion museum are worth a visit in themselves. But the Café remains the highlight for most. Beneath the Tiepolo fresco ceiling, you can enjoy a pot of tea while sampling a wide range of delicious desserts created by the best pastry chefs in Paris: the Pâtisserie Stohrer and Michel Fenet’s Petite Marquise. At lunchtime, salads, quiches, and a dish or two of the day are on offer (a scallop risotto last time we visited). 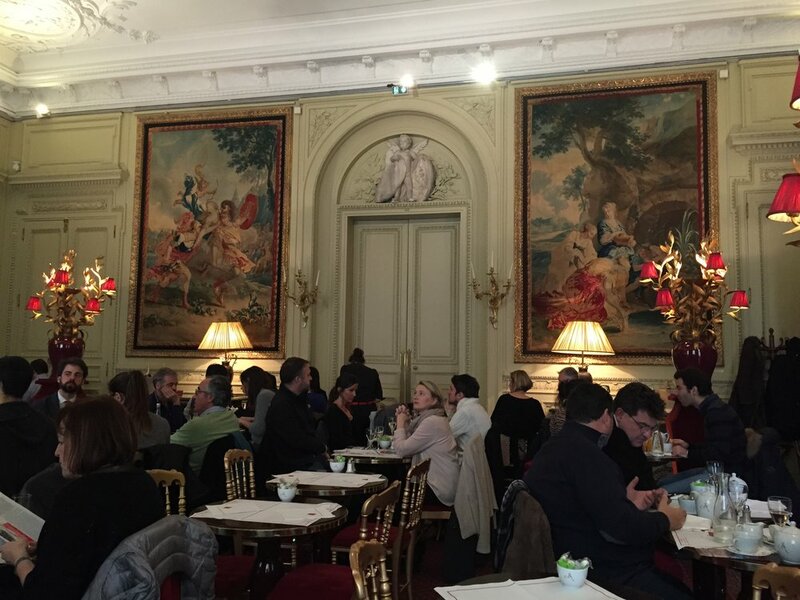 Every Sunday from 11 a.m., the Café Jacquemart-André transforms into one of the essential meeting places for brunch--rub shoulders with some of Paris' elite as you sip on champagne and savor your oeuf cocotte aux fines herbes. Accessible independent of the museum, the Café Jacquemart-André is open from 11.45 a.m to 5.30 p.m (lunch from 11.45 a.m to 3 p.m and snacks from 3 p.m to 5.30 pm). Brunch is served each Saturday and Sunday from 11 a.m. to 3.00 p.m.--by far one of the best ways to spend a leisurely Sunday in Paris. Be sure to dress the part.